Education is a massive part of life so I hope this Top 10 list of quotes about education will inspire you a little on your journey. On your journey? Did that just happen? Education is a never ending process from birth to death we are constantly learning. Whether it be from a parent, teacher, friend or our own children. In my case I'm learning patience from my kids very verrrrrrrrry slowly! I think we talked about buttons getting pushed somewhere else! Corny? I did mentioned I'm from Ireland. "Instruction ends in the schoolroom, but education ends only with life. A child is given to the universe to be educated." he needs education to turn him around." to prepare the young to educate themselves throughout their lives." 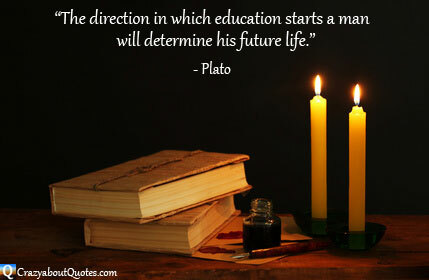 "If a man neglects education, he walks lame to the end of his life." "What sculpture is to a block of marble, education is to the human soul." in which all children have access to a good education."